The What: Middle Atlantic Products’s new LT Series Rackmount LED Work Light is a rack light that mounts vertically or horizontally anywhere in the rack, providing illumination wherever needed when working inside racks, furniture, and other enclosures. Available in single-light or a dual-light bar models, the LT Series Rackmount LED Work Light is a simple solution for a faster, more efficient integration experience. The Bottom Line: The LT Series Rackmount LED Work Light ships with multiple power adapters to meet the lighting needs of international applications. It features an adjustable light bar that can be angled, so its bright-white LEDs illuminate the full height of a rack enclosure. Its low-profile, unobtrusive design ensures it won’t impose on the installation and serviceability of the enclosure. 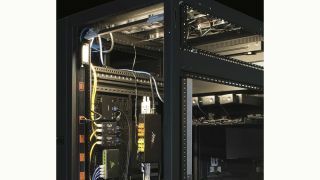 With a simple push of the integrated power button, integrators have full rack visibility.